Patellar fractures are classified according to Holt and Larson. The transverse fractures is the most common, resulting from a direct blow. Others include vertical, comminuted, and avulsed. 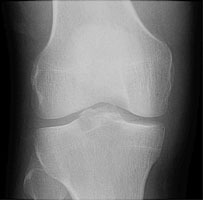 Differentiation is made from a bipartite patella, located usually at the superolateral margin. A AP radiograph of the knee. No definite fracture is seen. 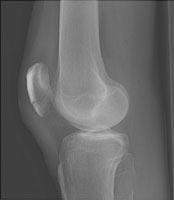 B Lateral radiograph of the knee. This depicts the fracture through the inferior pole of the patella.